Home » Care tips » Baby care tips » What Is Tummy Time? 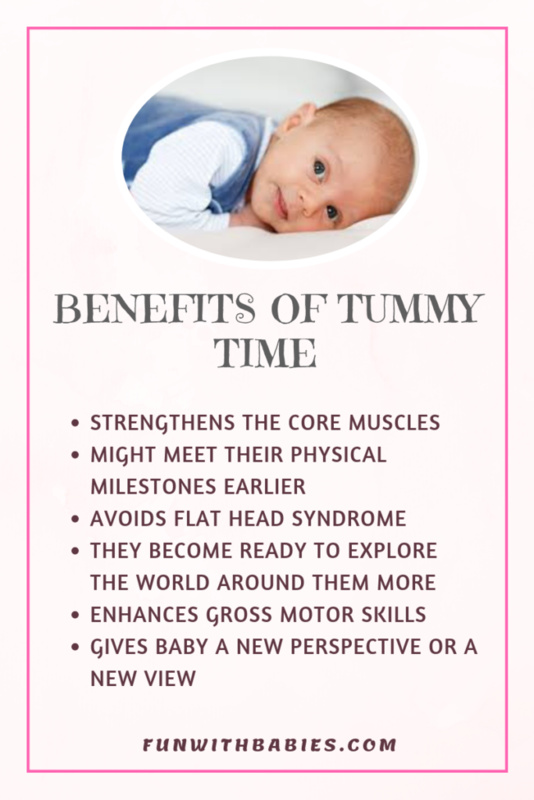 Why Is Tummy Time Important? In today’s day infants generally end up spending the whole day on their back and night also they sleep on the back. Consequently they rarely get a chance to work on their back muscles and neck muscles until they start to roll over etc. This sometimes delays their further development. All us adults need workouts to have strong core, the babies are no different. Tummy time is like a work out specially designed for babies. It is an activity were you put you baby on his or her stomach while she is awake and supervised. This activity strengthens back and neck muscles. It also strengthen the upper body of the baby. Tummy time is very good when the baby will learn to work against gravity. He will learn how to gain control of his neck so he can control it when he is sitting or crawling etc. 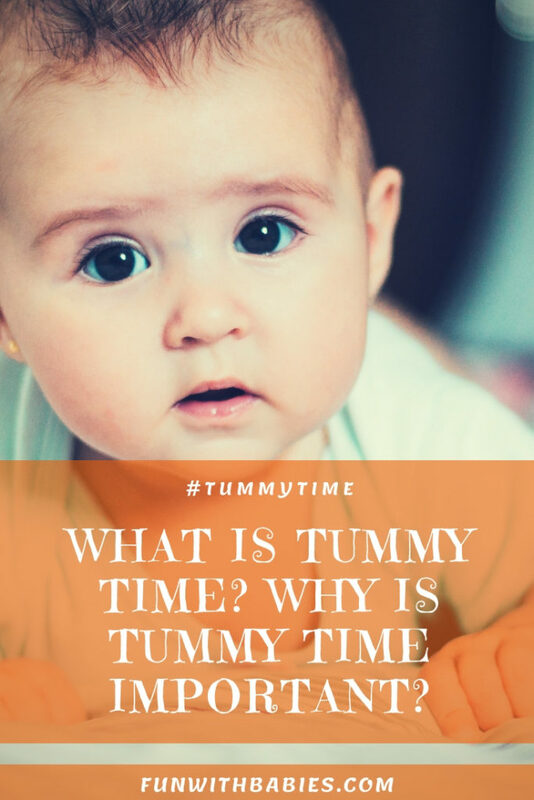 It is generally seen that babies exposed to regular tummy times learn and reach their milestones at a good speed compared to ones who have not been regularly exposed. The babies generally don’t like tummy time. Any attempt for this is always met with resistance in the beginning days. Don’t be surprised if your little one starts screaming during tummy time or cranks up. At such times instead of stopping tummy time completely, cut short the time and increase the frequency. Make it fun , include yourself and other family members in tummy time activity. Within no time you will have a baby who starts loving tummy time and will be waiting for it. There are a few kids who love tummy time right from the beginning. My little one is one among them. He achieved his milestones a little easier than the other kids of his age. You can start Tummy Time as early as second or third week after the baby is born. You can start earlier than this if you are confident about handling your baby because they are fragile. It is good to do it daily. Tummy time should be a fun activity. Do not make the baby feel like it’s a workout or you are pushing him. It is good for the baby, think of it as a change from baby’s normal regular routine. It is play plus activity time. In the starting days you can start by 30-35 seconds and 3 reps . It is best to give them 10 min of tummy time throughout the day for the first 2 months. Once your baby likes it you can extend it unto 30 minutes, distributed thought the day until the baby rolls over. Once your baby learns to roll over you can stop this dedicated tummy time activity cause the baby will start on his own. You would not need to motivate or push him for tummy time. He will love the new perspective he has of the little world around him. The best time for this exercise is once the baby is up from a nap or after a diaper change. Since the baby is most alert at this times. If your baby becomes cranky or shows signs of distress (Cries), you can avoid tummy time for that day. The Next time try to involve a few activities or evolve the tummy time activities to the likes of the baby. There are a few ways using which you can make this time interesting. Consult the baby’s pediatrician once before you start tummy time for your baby. It should not be a problem if you have a healthy baby. How to do “Tummy Time”? Bring out a play gym mat or soft but firm mattress on the floor. Place your baby on gently his/her belly on the mat. Keep the hands in front of them and the legs folded at knee for comfort. If your baby seems cranky, you can change the baby’s position by keeping him/her on your chest while you are in an inclined position. Change baby’s head direction at every few minutes. It helps strengthen the core muscles, neck muscles and leg muscles. Avoids flat head syndrome (a.k.a Plagiocephaly). They learn to roll over and sit early, that is they become ready to explore the world around them more. Keep the baby on a mat or a baby mattress to be used on floor, so the baby does not get hurt. Remember the surface baby has been placed on should be soft yet firm to help him strengthen. Baby should be alert and awake to get the most benefits of tummy time. You should always be around during the tummy time. Do not keep any sharp, small or any object near the baby during this exercise. You can keep toys around only if the baby is supervised at all times. Baby should not be put to sleep on tummy. Know The Best and Safest Sleeping Position For Your Baby. ← How to talk to your baby ? What are the benefits of talking to your baby?